Nassau County Legislator Laura Schaefer is pleased to announce the unanimous passage of a resolution to accept the donation of “No Smoking” signage from the Tobacco Action Coalition of Long Island to place in Nassau County Parks. In recognition of the difficulties that smokers face with breaking the smoking habit, Nassau County parks will now have signage at designated areas for smoking. All smoking areas will be situated away from playgrounds, ball fields and restrooms. The signage is being donated by the Tobacco Action Coalition of Long Island. “The Tobacco Action Coalition of Long Island is very pleased to be able to assist Nassau County in their efforts to communicate the new rules that restrict smoking to designated areas through the donation of free signage on behalf of the health and welfare of the residents of NC,” said Carol Meschkow, Nassau Project Coordinator for the Tobacco Action Coalition of Long Island. 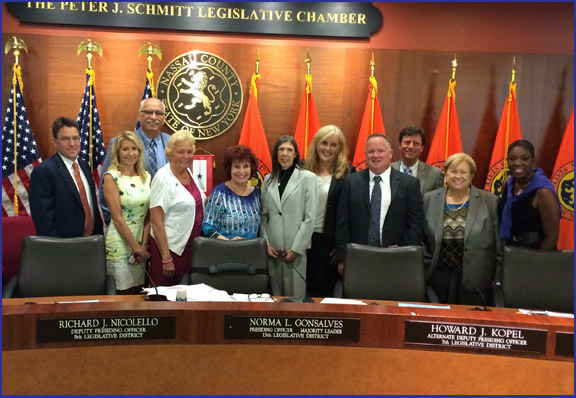 Pictured, left to right, are: Legislator Donald MacKenzie, Legislator Schaefer, Legislator Dennis Dunne,Sr., Legislator Rose Marie Walker, Presiding Officer Norma Gonsalves, Carol Meschkow, Legislator Delia DeRiggi-Whitton, Parks Commissioner Brian Nugent, Legislator David Denenberg, Legislator Judy Jacobs and Legislator Siela Bynoe.